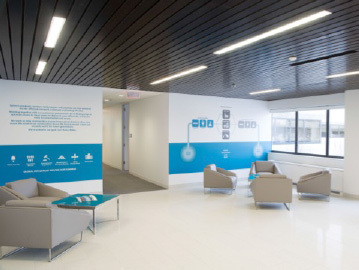 Wall Graphics | Xylem Inc.
A system of environmental graphics, which uses a grid of photography, brand messaging and solid color blocks, has been developed to enliven a facility’s interior spaces. 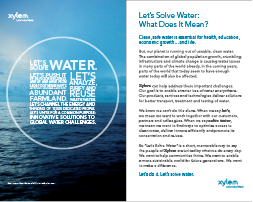 All of the elements are rooted in the common style of the Xylem brand and work together to express our identity. The examples provided below were proposed for two different sites within our organization. Use these examples along with the following guidelines to collaborate with your local designers and vendors to develop similar installations for your location. Where possible, please keep sizes and spacing proportional to the examples provided. Photos and color blocks printed on clear Plexiglas panels and mounted slightly away from the wall add dimension to the installation. 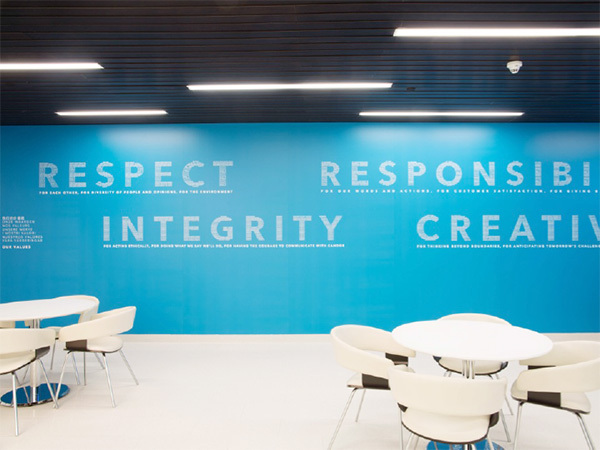 Other elements, such as logos and brand messaging, can be applied directly to the wall and integrated with the more permanent Plexiglas grid by using die-cut removable vinyl film. Painted graphics in the background add a third layer of interest and serve to unify the other elements. Be sure to work closely with your local vendors to determine which materials and methods of installation will be most suitable and cost effective for your site. High-quality color photography should be used. Images must be a minimum 225 dpi when printed full size. Asymmetry – Select and use photography that exhibits an asymmetrical composition. This means that the main subject of the photograph, such as a person or product, should not be centered within the frame but slightly askew. Scale – Photography should feature dynamic use of scale. Use scale to focus attention on key aspects of a photograph. People and products may be shown up close or from far away within their given environments. Vividness – Photography should be vivid and lively. Use imagery that is well-lit and colorful to convey optimism and vitality. When possible, tones within the photos should harmonize with the overall color palette. Choose dynamic images that showcase an interaction with or the importance of clean water. Crop images to exclude extraneous details and to focus on a single, uncomplicated subject. Portraits should reflect the multi-ethnic diversity of a global corporation. Choose colorful product shots that exhibit a pattern or emphasize a unique shape, such as groups of component parts or a close-up of a single product. Crop images to emphasize the pattern, interesting detail or unique form and to eliminate any detracting elements. 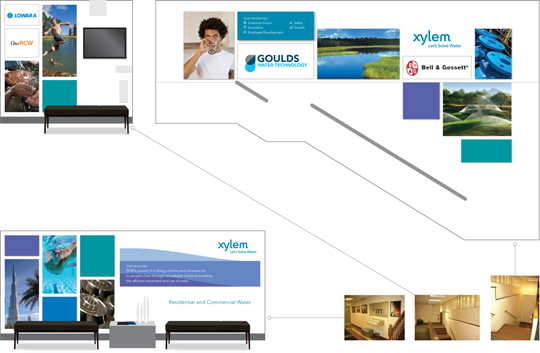 The Xylem logo, along with additional product logos should be incorporated into the grid layout. The company’s vision, mission statement, values or similar messaging may also be included. The messaging elements can be applied to floating panels or directly to the wall using vinyl film or paint. Current brand standards should be followed, including use of existing iconography, logo treatments and the Avenir Next family of typefaces. When using product logos, do not use the lockups. Instead, a Xylem logo should appear in close proximity. It is not necessary, though acceptable, to show multiple product logos in gray; they may appear in color. If panels are used, center messaging on each panel, keeping a margin of several inches on all sides. Color should be used consistently on messaging panels throughout the installation and should be distinct from additional color blocks. Solid blocks of color should be judiciously interspersed with photography and messaging panels to balance the color and visual flow of the graphics. Choose colors from the primary and secondary Xylem color palettes that coordinate with the other photography and messaging panels. Use no more than 3 to 4 colors, including any used for brand messaging panels. For the wall background color, choose a white, warm gray or beige that coordinates with our color palette. It is also nice to have an entire wall painted in one of our primary or secondary colors, but do so sparingly. The grid of photography, brand messaging and color blocks can be further unified through the use of background graphics. The Xylem wave graphics accomplish this task most effectively, but solid areas of color drawn from our secondary palette could also work successfully. Strictly limiting the color palette for background graphics will make the unifying effect most pronounced. Use alignment, scale and color to allow the wave graphics to “flow” from one wall to the next. Since the installation space available is unique to each facility, each grid display must be customized to best fit the space. There is an unlimited number of ways a grouping of panels can be configured, but please keep the following guidelines in mind when developing a customized display. Each display should command the majority of wall space available, and the space should not be shared with additional artwork or graphics. A variety of panel sizes should be used, but emphasis should be placed on photography and brand messaging. Brand messaging should be limited to 1 to 2 panels per display to provide impact. A conscious effort must be made to size and place all panels so there is a comfortable balance and flow between photography, messaging and solid color. One option for arrangement is to group photos and color blocks in “columns” of equal width on one side of the display while juxtaposing a brand message on the other side (see examples). Another option is a more free-form grid that allows for increased variety in panel size and placement (see examples). An attempt should be made to align the edges of several panels in order to create smaller “blocks” within the grid and avoid a haphazard look. Gaps between panels should be consistent within each display and across all displays at the site. Plexiglas panels are usually cut from sheets that measure 48″ x 96″ (122 cm x 244 cm). Therefore, to allow for edge finishing, no single panel should exceed 47″ x 95″ (119 cm x 241 cm). Limit the number of elements in the display. 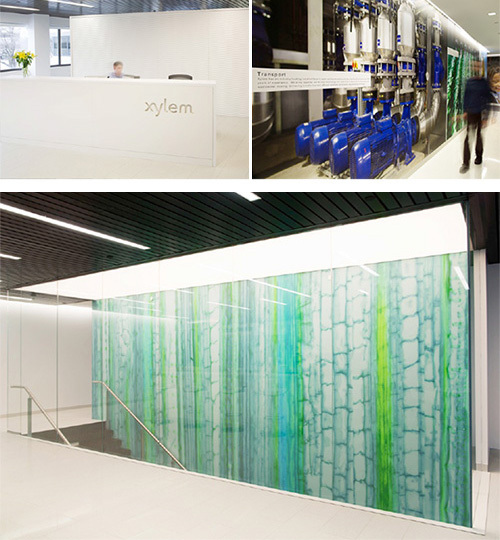 The Xylem logo, wave graphic and simple brand message can make an impactful statement on a single wall. Reduce dimensionality. A grid of photography, brand messaging and solid color blocks can be applied directly to the wall or on a single, oversized panel. Consider alternate materials or methods of installation. Vinyl film appliqués, canvas or foam core panels may be more suitable to your site. The wave graphic is an integral part of our brand and adapts well to environmental graphic applications. Use the wave graphic files provided on this site and work with local designers or vendors to adapt the sizes so they fit your particular facility. The waves can be applied directly to walls with paint, vinyl or similar materials. One option for small-scale installations is to use the pre-approved mural or poster files that are provided for download on this page. 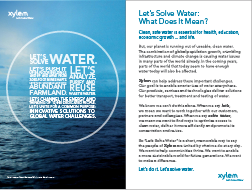 The artwork, shown below, consists of two panels that tell the story of “Let’s solve water.” The panels are meant to be displayed side by side, however, you can choose to display either one or both panels. The artwork is available in two sizes. Each panel of the mural measures 60 inches (152.4 cm) wide by 96 inches (243.8 cm) high, and the poster panels are 24 inches (61 cm) wide by 36 inches (91.4 cm) high. Work with your local vendors to determine the most suitable and cost effective materials and methods of installation for your site. Several wall graphic designs from the Rye Brook HQ re-design are now available for download and use in other office locations. These downloadable files are editable PDFs that can be opened in Adobe Illustrator if any changes are required. Xylem Values – designed in a way that they are composed of our eight primary languages. Xylem Global Locations – showing our HQ, sales, manufacturing and other locations around the world. Xylem Water Cycle Infographic – this is in two parts / files and we recommend the copy overview piece being installed to the left of the illustrative water cycle. They will need to be scaled and spaced according to your environment, so please work with your local designers and vendors to do so in a manner that maximizes visual impact and legibility, and in line with the overall brand guidelines. We recommend using die-cut removable vinyl film applied directly to the wall, but again please work with your local vendors to determine which materials and methods of installation are most suitable and cost effective for your site. 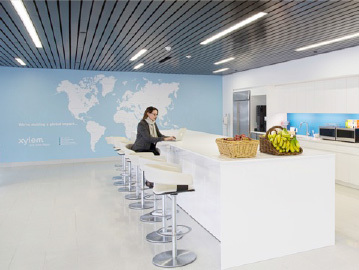 Alternative solutions can be requested, ask for advice about your office design by sending an e-mail to Ellen.Hermans@xyleminc.com.